Guduchi is a widely used herb in the world of Ayurveda and for great reason. This nourishing herb is also known as “Amrita” meaning Divine Nectar. Guduchi is a well known tonic and rejuvenator, while simultaneously being a powerful blood and liver cleanser. 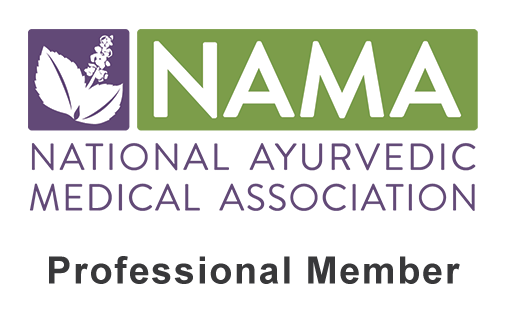 In Ayurveda it is considered tri-doshically healing, meaning it can be used for all body types. Whether used for detoxification or rejuvenation, Guduchi is a great option for a diverse amount of disorders and conditions. Although tri-doshic by nature, Guduchi tends to work best on Pitta disorders such as excessive heat in the system, inflammation, arthritis, liver issues and skin conditions. Its detoxification properties have a special affinity to the liver, as it targets this organ to cleanse, heal and strengthen. Although a great herb for detox, Guduchi is also considered a nerve tonic, as it heals and strengthens Vata dosha and the Nervous System as well. 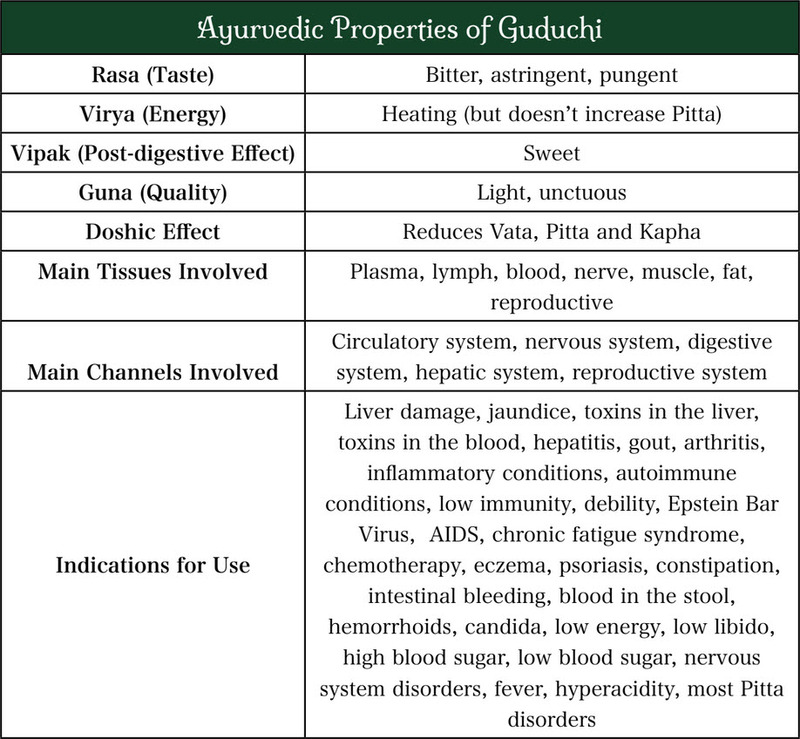 Guduchi truly is divine nectar and profoundly healing in many aspects. As an Ayurvedic practitioner, I constantly use Guduchi as a main ingredient in my apothecary products and individual client formulas. I have witnessed and personally experienced Guduchi’s healing benefits, as it has turned around issues such as chronic inflammation, joint issues, gout, toxic accumulation, autoimmune conditions, digestive issues and skin disorders such as eczema and psoriasis. 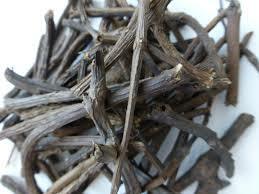 Although a powerful herb, Guduchi is also fairly safe, as it can be used in larger doses (relatively speaking). ***As with any herb, Guduchi should be used under the guidance of a knowledgable practitioner. Mix 1/4 tsp of Guduchi, 1/8 tsp of Neem and 1/8 tsp of Turmeric in 1/2 cup of warm water. For a deeper cleansing effect, add 1 Tbsp of Aloe Vera juice as well. Take this 3 times daily, before meals during Detoxification Therapy. **Alternatively, one can use our Love your Liver Tincture, or Daily Detox Formula. Take 1/2 tsp of Guduchi with 1 Tbsp of organic Aloe Vera juice in 1/2 cup of warm water. Take this mixture 3 times daily, before meals for at least 30 days. Simultaneously, externally use a medicated oil containing Guduchi such as Pitta Massage Oil. Apply to the effected area each night before bed. 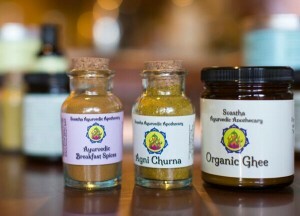 Take 1/4 tsp of Guduchi, 1/2 tsp of Ashwagandha and a pinch of Ginger. Mix this in warm water and take 3 times daily for at least 30 days. Also massage the effected joints each night with a warm medicated oil containing Guduchi such as Pitta Massage Oil.